The new session of the beginning runners class started last night. 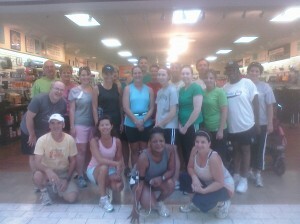 The class toughed out the unseasonably hot weather and came back after 3 miles looking like seasoned runners. Anyone can join the class at any time. Every Monday, 5:45pm at Garry Gribbles in Ward Parkway Shopping Center for the next 9 weeks. We know this is a very bad photo and will take a better one next week!